Arriving home from a meeting of Parliament in London, Sir Hugh Middleton is shocked to learn that a neighboring monastery has laid claim to one of his fields. Sir Hugh steadfastly refuses to yield his property, and further offends the monastery by sending his younger son, Stephen, to study under Dr. John Wycliffe. At the same time, Sir Hugh sends his elder son, Harry, to serve as an attendant to the powerful Duke of Lancaster. As Wycliffe seeks to share the Word of God with the common people, Stephen and Harry and their sisters help spread the truth, but what will it cost them in the dangerous day in which they live? 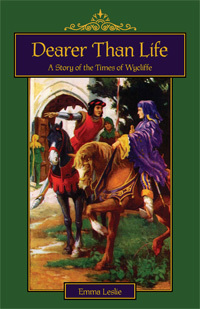 Story Setting: England in 1366 - 1384 A.D.
"My thirteen year old daughter is currently reading Dearer Than Life (and loving it!) - and she is very much appreciating the definitions.... After reading Dearer Than Life and The Captives, I feel as though Emma Leslie is now a dear friend! I honestly could not put these books - or the [e-books] down." ~ D.A. Emma Leslie (1837-1909), whose actual name was Emma Dixon, was a prolific Victorian children’s author who wrote over 100 books. Emma Leslie brought a strong Christian emphasis into her writing and many of her books were originally published by the Religious Tract Society.